Can you please offer help for the PRTG setup wizard Cluster Mode Selection screen? What's the difference between Standalone and Cluster mode? PRTG offers single failover clustering in all licenses—even using the freeware edition. 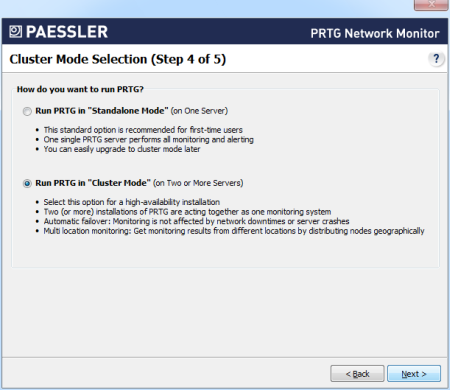 A single failover cluster consists of two servers ("Node 1" and "Node 2"), each of them running one installation of PRTG. They are connected to each other and exchange configuration and monitoring data. For setting up a cluster you need two or more (virtual) servers and there is one installation process necessary on each of them. In return, you benefit from seamless high-available monitoring with automatic failover and/or multi-location monitoring. Run PRTG in "Standalone Mode"
Run one instance of PRTG as a standalone solution. If you are not sure what to choose, take this option. You can integrate a PRTG installation in standalone mode into a cluster later on. Monitoring and alerting is performed by one single PRTG installation only. Run PRTG in "Cluster Mode"
Run several PRTG installations combined in a cluster. Select this option for a high-available monitoring solution. Two or more PRTG installations work together in one cluster and act as one monitoring system. Automatic failover: One PRTG installation takes over monitoring and alerting seamlessly in case the other installation fails or the server is restarted. Multi-location monitoring: You also have the option to monitor your network from different locations by setting up geographically distributed installations.